This rich dark amber coloured beer commemorates Norfolk's seafaring and maritime past. A full flavoured premium bitter named after Norfolk's most famous son and celebrating its seafaring and maritime past, this premium Strong Bitter kit produces 36 pints at an average ABV of 5%, yet manages to retain the full flavour of malt and hops without being a "heavy" beer. 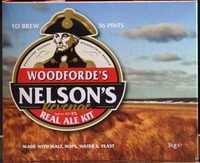 "I made this kit using just one of the tins to make 18 pints, bottling the result. I felt it was excellent and much better than the Woodforde Wherry, less hoppy. Very impressed."